Time goes on, and new birds and plants appear. The dairy workers are happy and content, at the level above neediness but below stifling high society. Tess and Angel remain in a state of limbo, but it is inevitable that they will come together soon. Tess is the happiest she has ever been. Both she and Angel enjoy their state of pleasant attraction without complicated commitments. Angel imagines that his preoccupation with her is merely philosophical. Birds and plants are again associated with the state of the women at the dairy, and Hardy portrays the workers as a sort of social ideal. Fate now seems to be working in Tess's favor. Angel is again idealizing Tess and trying to treat her as part of his agricultural study, but he cannot repress his true feelings. Tess and Angel meet often, as they both rise earlier than the other workers. When they are alone in the gray dawn they seem like the first people on earth, like Adam and Eve. Tess seems to Angel to take on a mythical significance and an unearthly beauty. He imagines her as Mary Magdalene, or the “visionary essence of woman.” He teasingly calls her Artemis or Demeter, but she wants to be called Tess. Then the sun rises and she seems to lose her divinity. Here the image of Tess and Angel as Adam and Eve is first revealed. Tess now becomes to Angel not just a symbol of Nature, but a mythical or religious figure. She takes on the archetype of pure Woman for him. For her part, Tess wants to be treated as an individual, not a symbol of a generalized whole. On these early mornings herons approach them, and Tess and Angel watch the fog cover the fields. Drops of dew cling to Tess's face and she gains a fantastical beauty that fades later in the day, in the heat of the sun and the everyday talk and activity of the farm. Birds again appear, here as good omens. Tess is still an unreal figure to Angel, and as such easier for him to love. Her midday self is less goddess-like, but has more of the true, human Tess. Cosby, Matt. "Tess of the d'Urbervilles Chapter 20." LitCharts. LitCharts LLC, 3 Nov 2013. Web. 25 Apr 2019. Cosby, Matt. "Tess of the d'Urbervilles Chapter 20." LitCharts LLC, November 3, 2013. 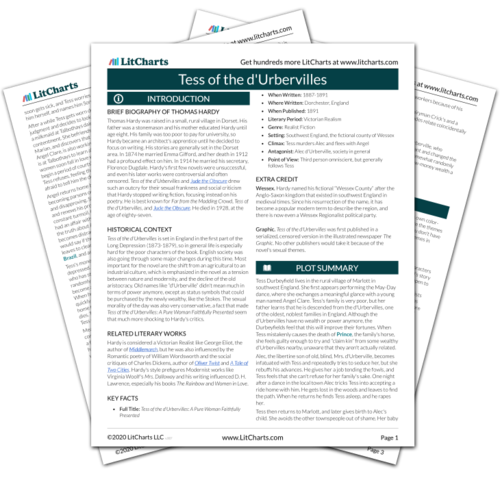 Retrieved April 25, 2019. https://www.litcharts.com/lit/tess-of-the-d-urbervilles/chapter-20.